American Psychiatric Publishing, 9781585624669, 281pp. Designed for interviewers at all levels of experience, The Pocket Guide to the DSM-5(R) Diagnostic Exam is the clinician's companion for using DSM-5(R) in diagnostic interviews. Both experienced clinicians and those still in training will benefit from the thoughtful, yet practical, fashion in which DSM-5(R) revisions are reviewed and incorporated into the 30-minute diagnostic interview. - Provides insight into the process of establishing a therapeutic alliance, which remains the goal of any psychiatric encounter, even one as brief as the diagnostic interview.- Offers an extensive set of appendixes with resources to enhance understanding. 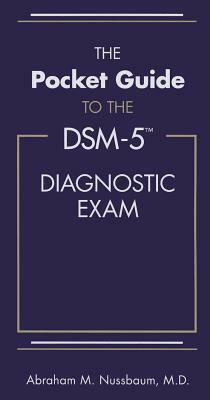 These include a brief, easy-to-use summary of DSM-5(R) disorders; a stepwise approach to differential diagnosis; the Mental Status Examination and a psychiatric glossary; the ABPN Clinical Skills Evaluation; DSM-5(R)-related diagnostic tools and scales; and coverage of alternative diagnostic systems and rating scales.- Provides a sequential framework for generating a differential diagnosis, using a six-step approach, that will help clinicians develop their clinical decision-making skills and ensure that they take into account the many and interrelated causes of mental disorders. Direct, practical, and informative, The Pocket Guide to the DSM-5(R) Diagnostic Exam will enable readers to efficiently and effectively employ DSM-5(R) as part of a comprehensive diagnostic interview. Abraham M. Nussbaum, M.D., is Director of the Denver Health Adult Inpatient Psychiatry Service, and Assistant Professor in the Department of Psychiatry at the University of Colorado School of Medicine.